The Pioneer DDJ-SR is a compact and professional Digital DJ Controller that fits nicely within the new Pioneer DDJ controller range as a trimmed down two-deck version of the DDJ-SX which is still capable of controlling all four virtual decks of Serato DJ. The new Pioneer DDJ-SR has a smaller footprint than the DDJ-SX and adds a new PAD PLUS button that gives the 16-performance pads even more functions than before. Be sure to see our full HD-Video and written reviews of the Pioneer DDJ-SX to get familiar with most of the functions found on this new DDJ-SR. The DDJ-SR still has the same overall build quality with a steel top faceplate, aluminum jog wheels, and plastic construction underneath. The DDJ-SR also has the performance pads (albeit in a smaller form factor) to control Hotcues, Roll, Slicer, and Sampler, but now they also have a PAD PLUS button that will allow the pads to function as HotCue Roll, Trans, Combo FX, and Sampler Roll. The DDJ-SR doesn&apos;t have the additional channelized inputs or standalone mixer option found on the DDJ-SX, but it includes an Auxiliary RCA input for emergency situations along with a Booth RCA output and Main balanced TRS output to connect the speakers. Build Quality & Setup: The new Pioneer DDJ lineup now consists of a newly announced DDJ-SZ Digital DJ controller which is the latest and greatest Flagship (top-of-the-line) professional DJ controller from Pioneer DJ division that offers the most complete control over the Serato DJ software and it resembles the look and feel of a real Pioneer DJM Mixer and their flagship CDJ-2000Nexus players. The Pioneer DDJ-SX is next in line in terms of size and features with a full four-channel layout, standalone mixer, and all the Serato control one would need. The Pioneer DDJ-SR is a smaller version of the DDJ-SX but still has the same professional build quality in a smaller and easier to manage form factor. 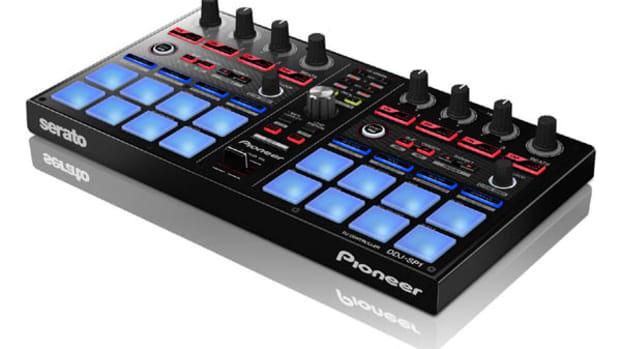 The Pioneer DDJ-SB rounds out the lineup as the smaller entry-level controller that has slightly less build quality, but still packs a good punch in terms of Serato DJ Intro control and affordability. In terms of build quality, the DDJ-SR feels very compact and SOLID. The DDJ-SR has the aluminium top jog wheels (which are a bit smaller than those found on the DDJ-SX), an aluminum faceplate for the top panel, and other metal reinforcements throughout the construction to give it a reassuring feel. The sides and bottom of the controller is made of durable plastic, but everything truly feels professional. Along the sides there are small hand-hold cutouts that make it easy to grab the DDJ-SR and take it with you on the go. The mixture of metal and plastic is just right as the weight isn’t too bad for mobile DJ use but the construction still feels sturdy and that it will hold up to abuse. Just as with the DDJ-SX, all of the EQ and effects knobs have a soft rubberized coating to them while the faders, Filter knobs, and Browse knob all have a hardened plastic feel. Everything here feels true to Pioneer-branded gear and it will definitely last some time to come. In order to set up the Pioneer DDJ-SR, the user can load the drivers and software using the supplied Software CD, connects the USB cable to the computer, add music, and get started. The recommended method for setting up software nowadays is to go to the manufacturers’ website to download the latest driver update to be sure the controller is operating with the latest offering. 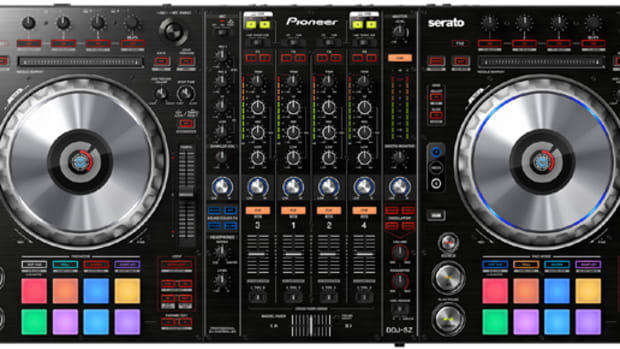 Then the user can then head over to the Serato DJ website to also download the latest and greatest Serato DJ software iteration and install it on the computer. The DDJ-SR comes bundled with the full Serato DJ software so that all of the main features are unlocked straight out of the box. The Serato DJ setup is still pretty much plug-and-play. I simply connected the DDJ-SR and started the Serato DJ software and everything was immediately recognized and ready to go. The user then connects speakers and headphones to complete the simple setup process. 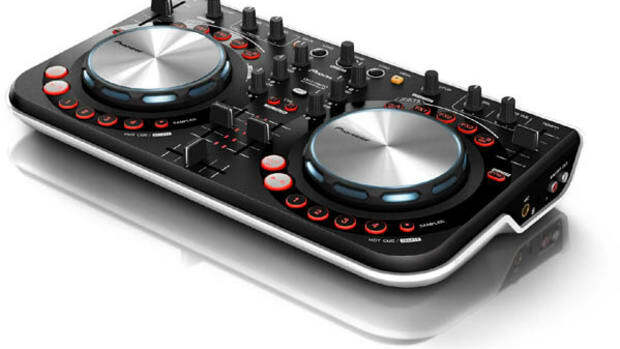 The DDJ-SR is completely USB powered, so there is no socket for external power. On a side note, the DDJ-SR is a fully MIDI mappable device that can be mapped to use with any DJ software of the user’s Choice. Right now there are really good Virtual DJ Professional Mappings on the VDJ website for the DDJ-SR and I’m sure there will be a Traktor mapping somewhere online soon enough. Front & Back: There are a limited number of inputs and outputs on the rear panel of the Pioneer DDJ-SR, but it should suit most users’ needs. On the rear of the DDJ-SR, there is a balanced master TRS output, a master/booth switchable RCA output (with its own volume control knob), and an RCA AUX input (with its own volume control knob) for line level devices such as an MP3 player or CDJ. There is also a USB port, on-off switch, and Kensington Lock on the rear panel. On the front panel, there is a quarter-inch Microphone Input with its own volume control knob. Also on the front is the Crossfader Curve knob to control the sharpness of the fader and a Crossfader reverse switch. Users can adjust this knob for a sharp cut for scratching or for a smooth drawn out fade for mixing. All the way to the front left is the headphone outputs (both 1/8-inch and ¼-inch are present) and the headphone volume control knob. Mixing Controls: At the bottom of the Mixing console is the crossfader. The crossfader feels just like the DJM series mixers (the 250 in particular) and most users will be satisfied with the scratch and mix performance of the crossfader. It has a very loose feel and the cut in distance is very low (about 1mm) making it ideal for DJ’s who like to scratch. The crossfader doesn’t appear to be easily user replaceable like the one found on the DDJ-SR, so we’ll have to check with Elliot from Innofader to see if a swap is possible. Next up is the linefaders. The linefaders have a bit more resistance than the crossfader. Above each line fader is a CUE button that illuminates to let the DJ know which channels will play in their headphones to cue the next track. Each of the CUE buttons double as TAP buttons which allow the user to drum the beat into the DDJ-SR to get more accurate BPM on the song that is playing on that particular channel. In between the linefaders is a Level LED meter that shows the levels of the mix either per channel or the master output. Above the level meter is a sampler volume knob that allows the user to adjust the volume of the SP-6 Serato DJ sampler. Above the Sampler volume knob is the headphone mix knob that allows the DJ to fade between the decks in CUE mode vs the master output. Above this is the Master volume knob. Each Channel on the DDJ-SR has a Low Pass and High Pass filter knob which works with the digital decks within the software. Each Channel has its own full-kill 3-band EQ and Trim (gain) knob at the top. At the top of each Channel there is a load button so that users can load a highlighted track into each particular deck at the touch of a button. In order to highlight a track, the user has an oversized plastic encoder knob and a back and Load/Prepare button that can be used to navigate through the software music library. The Back button also doubles as a View button which allows users to change the deck layout and waveform view position very easily. The Load/Prepare button doubles as an Area button that allows users to toggle through the different regions of navigation and the huge navigation encoder also doubles as a Panel view changer that allows the user to see things like effects, SP-6 sampler, and more. Jog Wheels: The jog wheels on the DDJ-SR really feel great. Gone are the push-top style jog wheels of the last generation of Pioneer DJ controllers and they are replaced with these aluminum top touch-sensitive jog wheels which produce an accurate one-to-one operation within Serato DJ. The jog wheels have a good weight to them and they are loose enough to do decent backspins and scratching/juggling. The sides of the jog wheel have a dented texture so that it can be used to nudge and slow-down the playing track for beatmatching. On a side note, the jog wheels on the DDJ-SR are a bit smaller than the DDJ-SX, but the performance remains intact. The middle portion of the jog wheels doesn’t have any visual feedback or needle indicator like the DDJ-SX or DDJ-SZ, but the performance remains very tight. The jog wheels have a button for Jog Mode which allows the user to switch between VINYL mode (scratching possible with the top aluminum plate) and Jog Mode (nudge and slow down track by using the top aluminum plate). 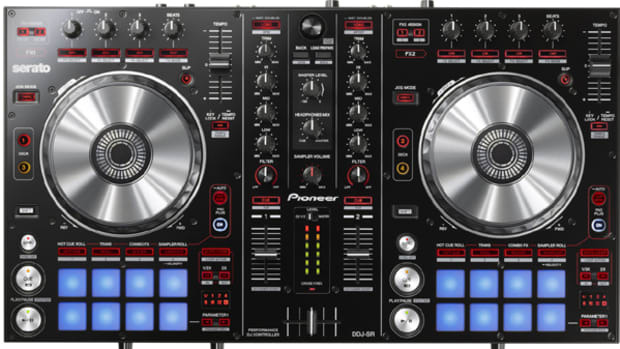 The Pioneer DDJ-SX also has the Slip Mode button which allows the DJ to manipulate the jog wheel, use loops, and cue points, etc, while the play-head continues to play the track so that the play position of the track never loses its place. This means users can do whatever they want to the track in terms of manipulation when the SLIP mode button is activated and the track will still remain on-beat and exactly where it should be if no one touched the track during playback. Also included in the jog wheel operation is the Tempo slider. These tempo sliders are pretty short in overall adjustment distance and it’s one of my minor gripes with the unit. The Tempo sliders work well overall and the resolution seemed good enough for accurate mixing, but it took some time getting used to the small form factor. There is a Tempo Range button below the Tempo slider that changes the range of the slider to 8%, 16%, 25%, 50%, and Wide. This button also works as a key lock and tempo reset button to get the speed back to absolute zero. On the opposite site of the jog wheel, there are buttons that are used to access the other deck layering. The left deck works as decks one and three while the right deck works as decks two and four. These LED buttons will allow the user to toggle to each deck. There is a Shift button for each deck as well located right underneath the deck layer buttons. Deck Controls: One of the most sought-after features on the DDJ-SR is the inclusion of the 16-performance pads that control multiple functions similar to its older brother, the DDJ-SX. These performance pads are a bit smaller than those found on the DDJ-SX, but they still feel essentially the same. These 16-performance pads have a rubberized feel to them and they are made for performing and drumming. There are 8 pads per deck and all of them are velocity-sensitive (meaning they know how hard you hit them) and they have a blue backlit to them as well. These pads don’t have the absolute click-sound that you get when you press the buttons of the Traktor F1, but you can still see per the backlit when each button registers an actual hit. I didn’t have any issues using the pads and they are sensitive enough to register the hit even when pressing the corners or sides of the actual Pad. These Pads are used to control Hot Cues, Roll, Slicer, and Sampler. There is a Pad Plus button that gives each one of these original functions another relative function for even more mixing possibilities. The breakdown of each Pad control feature is listed below. Roll/Trans – The Roll function starts an auto loop for the length that the pad represents. The first pad is the shortest, second pad is longer, etc. This is a loop with slip-mode activated that allows the loop to activate when pressed, but the play-head returns to its normal position as soon as the pad is released. Trans allows users to cut the volume in and out at different intervals that correspond to the pads. Slicer/Combo FX – During Slicer, these 8 pads turn into eight small “slices” of different sections of the song that is currently being played. Basically the Slicer divides a portion of the song into eight smaller pieces that can be rearranged and played back in different order depending on how and when you hit the pads. The software remembers where the song would have been during playback if you hadn’t touched the slicer in the first place, so the song returns to the normal playing position when you are done “slicing” it up. Combo FX allows users to trigger and alter multiple effects and filters using a single pad. Sampler/Sampler Roll – There are a total of 12-samples per side for a total of 24 samples that are ready at any given time. The First six buttons are the actual sample banks while the two remaining buttons allows the user to scroll through the (4) pages of available sample banks. When the sample button is pressed, the sample plays in the mode that is selected. Sampler Roll mode allows the sample to play at the current BPM over and over again as long as the pad is pressed. To the left of the performance pad section is the hard plastic/shiny Pioneer Play/Pause and Cue buttons that are also found on the CDJ’s and a small shiny Sync button above them in order to quickly match the BPM of the track in the deck with the master deck. To the right of the performance pad section is the separate Loop control area. In the loop section, users can activate an auto-loop, shift the loop to make sure it’s on beat, grow or shrink the loop, or manually select the in and out points of the loop. Users can also transfer loops into the Sampler section by saving it to an empty Sampler Bank on the pads. All the way to the top of the Pioneer DDJ-SR decks are the effects controls. Above the left deck there is an FX1 module and above the right deck there is an FX2 module. Both effects modules have four rubberized knobs and an illuminated button underneath each knob to set different parameters of each effect. Users can now have up to three effects per module using the new Serato DJ iZotope effects and they work just as good here as they do on the DDJ-SX. There’s also an FX Assign section that allows the user to separately toggle the effects bank activation onto each deck. There were only a few minor gripes with this setup package that I could find during my tenure with the DDJ-SR. The first one is the rather small Tempo Sliders that take a little time adjusting to if you are in the habit of using real vinyl turntables or other full-sized DJ controllers. The second gripe with the DDJ-SR (or almost any other Serato DJ controller) is the lack of SP-6 sampler controls. 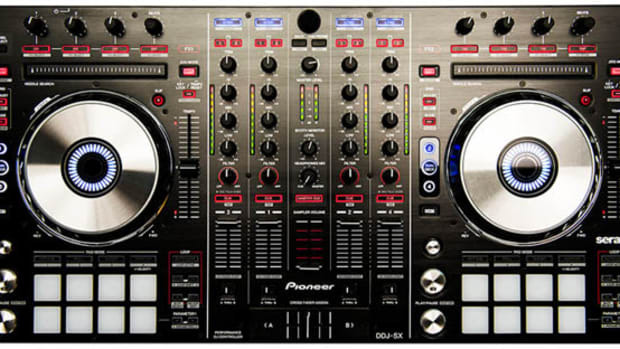 With the DDJ-SR, users can only play the sample, but they can’t change pitch, effects, and other parameters without touching the computer. I’m sure many users will end up purchasing an additional controller to MIDI Map within Serato DJ for the sampler functions, but it’s worth pointing out that you can’t do much more than play the samples using the DDJ-SR hardware. In Conclusion, the Pioneer DDJ-SR Digital DJ Controller with Serato DJ is a durable, professional, portable, and compact all-in-one mixing solution for any DJ who wants most of the functions and layout found in the DDJ-SX in a slightly smaller package. The DDJ-SR has the cool 16 velocity sensitive backlit performance pads that control hot cues, samples, Roll, and Slicer along with the Pad-Plus functions that give the DJ even more flexibility. 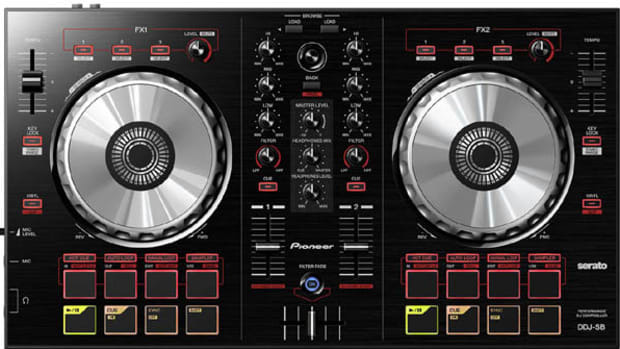 The Pioneer DDJ-SR also has the emergency Auxiliary RCA input so that users can connect MP3 players or other line level devices in case of a software meltdown. The DDJ-SR also has very high resolution metal-top jog wheels and an equally satisfying crossfader that’s suited for both scratching and mixing. The Pioneer DDJ-SR comes highly recommended to any intermediate to professional level-DJ’s who wants to use a powerful controller in a compact footprint that works in perfect harmony with the Serato DJ software.